Spurs will be looking to make it three Premier League wins in a row against a rejuvenated Newcastle in the early kick-off on Saturday. It is the second of a three match run for Spurs at Wembley, with victory over Watford on Wednesday extending the gap between them and fifth place in the Premier League to seven points. In somewhat surprising circumstances, forgotten man Vincent Janssen will return to the Spurs first team squad for the remainder of the season. The Dutch striker was not registered at the start of the season but because of Mousa Dembele’s move to China and Georges-Kevin Nkoudou moving to AS Moncao on loan, there were two registration places open in the Spurs squad. Mauricio Pochettino confirmed in his Friday press conference that Janssen would fill one of those empty spots, meaning that there could be an unlikely return to action for the seventeen million pound man. Newcastle have endured a tough season under Rafa Benitez, however in the last week their campaign has took a turn. The Magpies came from a goal down to defeat defending champions Manchester City in the week and on Thursday made a record signing in Paraguayan attacker Miguel Almiron from Atlanta United. They will therefore be in high spirits heading to Wembley, where they lost 1-0 in the Premier League last season thanks to a goal from Harry Kane. There is no new injury news to contend with for Mauricio Pochettino, for what seems like the first time this season. That means that Ben Davies is still out for an unspecified period, along with Harry Kane and Dele Alli who are expected to return sometime in March. The only doubt is Heung-min Son, who Pochettino admitted did not train much on Thursday due to tiredness after the Watford match. The South Korean has only recently come back from playing three matches in quick succession at the Asian Cup, so it is likely he will not play the full ninety minutes at Wembley. After coming on at half-time and changing the tempo of the match against Watford, Lucas Moura is pushing for a start. There could also be recalls for Kieran Trippier and Eric Dier as Pochettino looks to fully utilise his squad in their third match of the week. New signing Miguel Almiron will not play against Spurs as he waits to receive his work permit, however fellow deadline day signing, Antonio Barreca, is available for Benitez and could come into the matchday squad. Elsewhere Paul Dummett, Jonjo Shelvey and Mohamed Diame are all doubts for Spurs and it is not likely that Benitez will risk them. Ki Sung-yueng, Joselu, Karl Darlow, Rob Elliot and Yoshinori Muto all remained injured for the Magpies. It would be no surprise if the same starting XI that beat Manchester City starts against Spurs, meaning that Isaac Hayden and Sean Longstaff will continue in central midfield. Hugo Lloris will start and captain the side on Saturday. He was involved in another questionable moment against Watford, failing to deal with a corner kick which resulted in the opening goal, but Pochettino trusts his man. In front of him we think that Pochettino will switch to four at the back, having started with a three man central defence in three of the last four matches. That means that Davinson Sanchez is likely to drop to the bench with an extra midfielder coming into the team to replace him. Kieran Trippier is expected to replace Serge Aurier at full back, although Moussa Sissoko played there for some of the second half against Watford so is another option in that position. 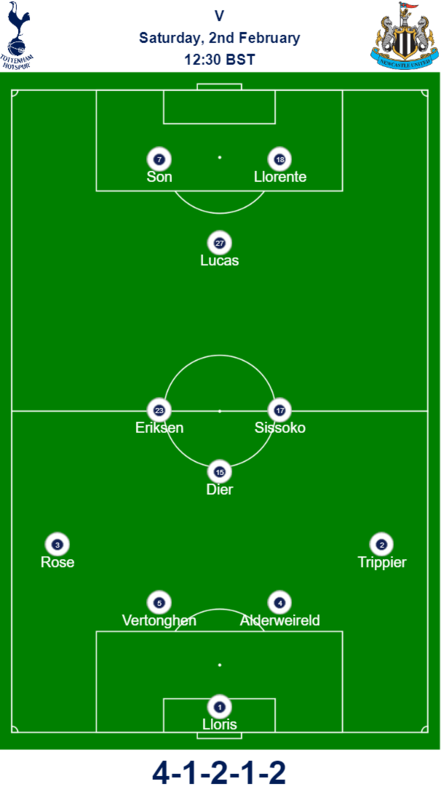 In midfield we think Eric Dier will come in, with Harry Winks the player to be rotated. Alongside him we predict will be Moussa Sissoko and Christian Eriksen with Lucas Moura given a central role slightly in front of them. Finally, if they are both fit, Heung-min Son and Fernando Llorente will start up front, as they did against Watford. After both scored midweek, Pochettino will be hoping that a partnership between them is forming and it will be interesting to see how they link up on Saturday, particularly if Moura also starts behind them. “The Premier League is the most competitive because of the schedules. We play Thursday in the Carabao Cup, Sunday at Palace, Watford played Saturday so we had one less day and now we will play a team that signed players and had one day more. That reduces or put more in the same level, if you arrive from the space from another planet and arrive in England and go straight to Newcastle and watch the game, you don’t see the difference because of the circumstances that can only happen in England. Sometimes you can see a side that won the Premier League and one that is fighting for the relegation that there isn’t too much difference and they may happen tomorrow but we will make sure we will compete in the best. After his goal against Manchester City midweek we’ve picked out Salomon Rondon as our Newcastle player to watch out for. He is very much in the target man mould and can dominate and bully opposition defenders if allowed to. It is likely that Newcastle will set up in a 5-4-1 formation so he will be vital to their efforts in holding up the ball and bringing his teammates into the attack on Saturday. Andre Marriner will be the referee at Wembley Stadium on Saturday. He most recently officiated Spurs in their FA Cup third round clash with Tranmere Rovers, which was two days after the last time he refereed Newcastle in their 2-0 home loss to Manchester United. In his most recent match, Marriner sent off Wilfried Zaha after he sarcastically applauded him for awarding him a yellow card. It will be a tough test for Spurs, as it always is in the Premier League. Newcastle will be a hard team to break down and will be full of confidence after their victory over Manchester City. Having said that, morale for Spurs will also be high after coming back from behind to beat Watford and we think they will have that bit of quality to see off Newcastle in the end. Our prediction is Spurs 1-0 Newcastle. Our Spurs tickets and hospitality packages are available for all of Spurs upcoming home matches, including the fixtures that have recently moved to Wembley that are now on special offer. To purchase, click on the relevant link below.